Hey! The New Everything has a four-star review in the AGE / EG. I don’t know how many stars one can potentially earn but none of the other offerings this week have more. It’s not published on line, so what the hell, that touch typing I learned at school has got to be good for something. Right? 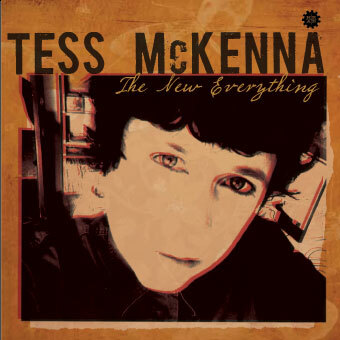 With a vocal comfort zone that in past performances has seemed to swing with ease from melodic balladry to twangy country, what’s new about everything on Tess McKenna’s stylish and thoroughly satisfying fourth LP is that it’s all fallen into place. Recorded in Melbourne with Barry Stockley joining her at the controls, she’s got the mix just right between acoustic singer-songwriter and plugged-in band material. Gentle strummers such as the title track, Pancho Style [should be Poncho style] and Down By the Sea serve to perfectly set up the electric guitar crescendos of numbers such as Fill me Up. Love is Gone, a sinewy blues number, could have come from a hot’n’sweaty Mississippi juke joint, smouldering for nearly eight minutes without ever quite igniting. Better still is energetic rocker Hummingbird, with strategically placed harmonica lines. Rumbling bass and driving drums give Tidy Town a heavier, ominous feel, then it’s back to the blues on nine-minute closer Still our House, which is also the closest she comes to Tamworth on this set of songs. McKenna launches The New Everything at the Northcote Social Club on Sunday at 2 PM. I don’t read the EG as much as I used to so can’t vouch for the stars, but I reckon it makes The New Everything pretty hot stuff. And I SAW the review, as I happened to have a squiz on Friday. Brava!! Wow, four stars is pretty good and I saw the review too!